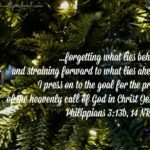 On this second Sunday of Advent, we turn to Philippians 2 for directions for the next stage of our journey toward the joy the angels sang about. Last week, at the beginning of our journey, the Apostle Paul’s letter of joy and encouragement led us from grace to gratitude, then discernment and courage and—with realistic expectations—on to joy and unity. We need to remember that Paul wrote to a congregation—people in community with one another—not to individuals in isolation. What applied to the Christian community in Philippi applies to us today. We are unlikely to find joy in isolation or in disagreement, dissention and division. We need one another. We need community, and Paul’s practical advice applies to our families, our friend groups and those we work with. Which keyword or theme speaks to me today? What lesson can I learn from this passage? What can I give over to God? Whom do I know—family members, friends, famous people, even literary figures—who model the character trait or attribute I need today? What am I thankful for today? What were my moments of joy? Last Sunday I stressed the importance of unity within our families, especially in times of significant stress, loss and grief. In Philippians 2 Paul suggests concrete ways to strengthen our relationships with friends as well as family. Within our community of friends and family we should be able to find encouragement, consolation, sharing, compassion and sympathy. If that isn’t happening, why? Paul is referring back to his veiled references in chapter 1 to dissention in the church at Philippi. He advises them that they need unity in order to stand firm against the opposition they face. Likewise, Paul urges us to seek unity, be of the same mind, having the same love, being in full accord and of one mind. Corporations almost always have written mission statements and core values. Big business understands the importance of everyone being on the same page, working toward a common, clearly defined goal. We need that sense of shared values and purpose with all our significant relationships. While it may sound impossible, Paul clearly believes that we can find that unity in life together. The solution is unselfishness—putting others first. 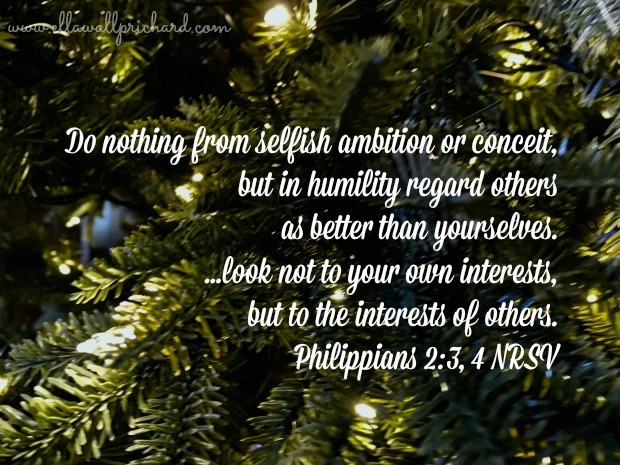 Paul’s advice is simple: Do nothing from selfish ambition or conceit, but in humility regard others as better than yourselves. Let each of you look not to your own interests, but to the interests of others. Paul suggests that some in the church are watching out for their individual interests, not what is best for the group. Some think they are better than everyone else, entitled to special attention and privilege. That is the killer in family unity, when everyone starts worrying more about their own position and needs than anyone else’s. It happens among friends and in the church and workplace as well. Probably most of us have felt used at some point by someone who was eager to climb past us on some ladder of prestige and status. When I was a child, I was taught in Sunday School that JOY is an acronym for Jesus, Others, You. In other words, to have joy you need to put God first, then others and lastly, yourself. That is too simplistic. We cannot ignore our own physical, spiritual, emotional, social and financial needs; but somehow we must find a healthy balance, treating others with the same respect and consideration that we want. After Lev’s death, I realized that focusing on my pain and emptiness stripped away all vestiges of contentment and joy. When I took my eyes off myself—when I left the pity party to reach out to others, I lifted my spirits and nourished my soul. How do we acquire the kind of unselfishness that is necessary to build a shared purpose? 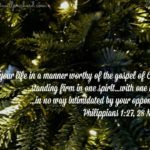 In the previous passage Paul writes…in humility regard others as better than yourselves. Now he gives us a role model for the kind of humility he is talking about. Let the same mind be in you that was in Jesus Christ. The way of humility is not the way of the world today. We live in a “me first” society full of hubris, egotism and self-promotion. Humility is undervalued and misunderstood. It is not self-abasement and false modesty, where we deny our abilities and successes. Rather, it is our realistic appraisal of both our strengths and our weaknesses. Without humility, we cannot continue to learn and grow. Humility is not my strong point. I was proud of my independence, of my ability to do whatever I needed to do to accomplish the tasks before me. Then Lev died and I acquired new responsibilities where my best was not good enough. I had to admit that I did not understand. Time after time I had to swallow my pride and ask for help. I also prided myself on my emotional strength and self-control, and I was not able to admit my fears and anxiety—even to myself—for months. When I finally acknowledged that I needed help from others, my relationships with my family and with business associates improved markedly. At last we could work together toward a common goal. In humbling myself, in accepting the fact that I was not capable of doing all that I wanted done, I began to find serenity, an absolute necessity before we can reach joy. To get to that point I needed serenity. You may hear and read a completely different message. Paul first advises the Philippians to continue to obey his instructions. They need to work together—and to allow God to work in and through them—to carry out God’s mission and purpose. Then he tells them to do this without murmuring and arguing so that they can shine like stars, light in a dark world. Only after we accept our circumstances can we move to the kind of joy that Paul describes here—a joy that flows from gratitude in the midst of loss and depression. Because the theological language is difficult here—poured out as a libation—I am going to quote from The Message, a popular modern paraphrase by Eugene Peterson. Even if I am executed here and now, I’ll rejoice in being an element in the offering of your faith that you make on Christ’s altar, a part of your rejoicing. But turnabout’s fair play—you must join me in my rejoicing. Whatever you do, don’t feel sorry for me. While not all theologians agree that Paul is talking about his death, the message for us is still the same. We can find joy in our circumstances, which open doors for ministry and service for others. That is selfless gratitude! Try praying, Thank you, God, that my situation has given me the opportunity to…. Furthermore, we should not want others, especially those whom we reach out to, to feel sorry for us. They should be glad that circumstances brought us together. It took me four years to get to that place. First I had to quit running from my grief, filling every second with busyness. When I went alone to Nantucket, where I knew no one, in summer 2013, I found the peace that only comes in solitude. That was the moment when I first realized I could claim joy if I shared my journey through grief, using Philippians as my guide, with others. It has proven to be a life-changing experience for me. Paul proceeds to demonstrate his unselfish love for the Philippians. We learned in the first Meditation that Timothy, whom he regards as a son in the faith, is with him in prison, serving as his assistant. Now out of his concern for the Philippians, who are allowing divisions in the group to rob them of their joy and unity, he is sending his most trusted friend to them. That’s a huge gift of sacrificial love! He writes, I have no one like him who will be genuinely concerned for your welfare. Timothy becomes another role model for us. Consider again the virtues of encouragement, unselfishness and humility. Those are the characteristics of genuine friends. What kind of friend are you? Almost every widow I know has described her surprise at those who were not there for her after her loss. True friends are there for us in the bad times as well as the good times. They are there whether it’s convenient or not. They demonstrate genuine commitment, not mere interest. After Lev’s death, I was humbled by the single women who reached out to me in friendship, even though I had not reached out to them when they lost their husbands through death or divorce. They taught me how to be a friend. They are my mentors and role models. Again, the message I receive from these verses is implicit, not what the theologians write about in their commentaries. Epaphroditus, a Philippian, is also with Paul, and Paul is sending him back home, where he believes he is more needed. He instructs the Philippians, Welcome him…with all joy and honor. Be hospitable. I hear a lot about the gift of hospitality, but Paul never lists hospitality among the gifts of the Spirit. He writes in Romans, Practice hospitality. It applies to all of us. It’s how we nurture the relationships we have. It’s how we build new relationships. We reciprocate. We initiate. Instead of throwing pity parties, we throw parties for our friends. As the marker dates approach, we can plan events that build in anticipation. Here’s where joy = memory + anticipation. Whether as the sender or the receiver of an invitation, we can have days or even weeks of anticipation, and afterwards the good memories. In hospitality, we share our joy with others. I am taking my own advice. I am cooking dinner for close friends on December 16, my 55th wedding anniversary. Our family will be together to celebrate Christmas, which thrills me. But I know I will have a letdown when they head in different directions at noon on the 25th, so I’ve started checking with my friends, to see who else will be alone. I’m inviting them over to spend the evening. If you missed the introduction to the Meditations, click here, Moving Toward Joy, for background to the Scripture. Dr. David E. Garland, “Philippians,” The Expositor’s Bible Commentary, vol. 12, Ephesians–Philemon, ed. Tremper Longman III and David E. Garland. Grand Rapids: Zondervan, 2006. A personal request: Would you consider serving as a beta reader, advising me on how to make these Meditations more meaningful? When my book is published, I plan to post daily meditations online to correspond with the 28 chapters of RECLAIMING JOY, along with a leader’s guide for small groups; and I need your input. Thanks! You can post in the comment section of my blog or email me ella@ellawallprichard.com. Portions of this meditation are adapted from Ella’s forthcoming memoir, RECLAIMING JOY, to be published by the Baylor University Press in 2018.